During 2013 Microsoft upgraded Office365 to Wave 15. I’ve previously written about using both Gmail and Evolution with Office 365. The good news is that both still work. If you have previously configured your client with the pre-Wave 15 settings it will continue to work, but obviously Microsoft may withdraw this feature at a future date. If you have rolled this out in a production environment it might be worth thinking about an upgrade strategy. The only difference being the access port used for IMAP access. Three or four months ago I bought myself a chromebook - really in frustration after my main laptop at home took 45 minutes to boot onetime after a series of Windows updates. At the same time I’d become frustrated with the slow start up time for my Windows netbook, so I thought a change of technology might be appropriate. I find Google Docs good enough for most basic writing, and the Google spreadsheet application is similarly good enough for most basic operations. At the same time I’m perfectly happy to use the web version of twitter, and I use the Innologic web application as my RSS feed reader. In short I can spend a whole afternoon quite productively inside of Chrome. This was also intended as a second computer - the one that goes to meetings and goes travelling so being stateless and having everything synced to the web was a plus. After a few months, I can say with some confidence that it’s a good choice. Evernote has been perfectly usable via the web. and I have never yet found myself in a situation where I wish I’d got something else. In practice the chiclet style keyboard is no worse to type on than any other budget computer and the screen is reasonably bright and sharp. I’ve also severely tested it’s offline capability. Mainly I’ve used it at home, which has been an interesting experience as it’s fair to say that our home ADSL link is groaning under the strain of supporting multiple chatty network connections, while competing for bandwidth with all of our neighbours increasingly busy connections. Our landline connection goes via the neighbour’s apple tree to a junction box on an old phone pole, and then via the legacy overground copper network back to an exchange about 3km away. As a result we’ve always had dropouts and slowdowns. It is however getting steadily worse - as the ownership of computers and tablets rises, and as the network gets older and busier, the attenuation and loss of sync pulses has got markedly worse, meaning that using the network connection can be a fairly stochastic experience - especially in late afternoon. I was worried about how this would affect the Chromebook. Obviously web browsing and email need a network connection to be present, but on the other hand the google docs app copes pretty well with the network going walkabout - I’m yet to lose anything significant. It’s here though that not having a local Evernote client does become a pain - basically I store all my notes and supporting documentation in Evernote, and having to rely on the web version means you need to be online to search it. I have a 3G USB modem that I originally bought eighteen months ago for our trip to South Australia. That was fine as it worked well with my netbook at the time. Of course since then we have taken to using tablets more and the Chromebook of course does not support USB modems. I’ve just bought myself a noname 3G router that you plug the USB modem into and this allows you to create a wireless network. In theory this means that we will have a backup network when our main link is being stupid and yet allow us to take a network (and multiple computing devices - sad people that we are) with us. That great nineteenth century invention, the universal postal service, is slowly dying. Canada Post is phasing out delivery to the home, the New Zealand postal service is reducing deliveries to three days a week in urban areas. In the UK, the newly privatised postal service is getting rid of posties bikes while AustraliaPost soldiers on with five day a week deliveries for the moment, albeit by charging an arm and a leg for a fairly basic service. And of course, it’s all due to email. Not online shopping, email. In fact most postal services are keeping themselves alive by delivering packages for the various online shopping service. Everything from second hand books and laser toner to running shoes and business shirts. It’s truly staggering the amount, and variety, of stuff we buy online, and it all needs to be delivered, and in the main it’s the postal service that does the delivering. Here in Canberra we still get a postie on a moped, but with Australia Post encouraging people to collect their own parcels from a mail centre one wonders for how much longer it will be economic to provide a mail delivery service. Certainly the amount of standard mail we get has fallen off a cliff. All our bills come electronically, all our bank and credit card statements. No one much writes to us anymore, it’s all email. About the only mail we get, other than junk mail, is a postcard from our dentist reminding us about checkups, plus an annual letter from the vet about the cat’s vaccinations. In fact, we don’t get our mail delivered, we have a private post office box and have our mail delivered there, simply because we get a lot of books and other small packets and it was simply easier to have it delivered somewhere we could collect it from easily, rather than have to trek to some post shop in some nameless suburb and line up to collect our mail. At the same time we send very few letters. Christmas cards and the occasional official document and that’s it. Even though I write to my elderly father, who despite trying valiantly, has never come to grips with email, I use a service that takes my letter, prints it out, and posts it overseas, for a dollar less than it would cost me to do the same at home. I’ve just tweeted a link to an article by Charlie Stross on why we still use Word. And he’s dead right. Over my thirty or so years I’ve had a lot to do with text processing - converting documents from one format to another, creating documents that could be used as structured input but still read well as print and the rest. I’ve also seen a lot of horrorshows in the print and typesetting world, including a room of typsetters (people, not machines) marking up text in vi fullscreen on lovely shiny Macs, or the time a certain printer manufacturer explained how to override the defaults by creating this firmware macro (again in vi) and prepending it to the front of a file. But, at the end of the day we come back to Word. Almost everything uses and understands the docx format, and Word of course does it better, quicker and more optimally than product with reverse engineered docx handling. There is little or nothing in any of the document workflows out there that could not be done by something else, TeX perhaps - equally powerful, but unfortunately no one wrote a decent graphical front end for it in the eighties when Word first came on the scene. Word came to dominate the market place. Other, equally good alternative products, eg WordPerfect fluffed the transition to windows environments, and some, such as AmiPro were just plain out competed. And so it came to pass that everyone who wanted your text documents expected a word document. Which is why I have a copy of Word. Libre Office might be as powerful. Markdown might be faster, Google Docs good enough for meeting notes and brainstorming, but at the end of the day, if the text has to go through a workflow it means Word. The social web is a phenomenon of our times when the web started to reflect our interactions and communications. Who speaks to whom, who says what about what, how many people talk about what. Information that marketers want, the information underlying the altmetrics movement in academia, and it would appear, the various security agencies. Mapping out interactions is not new, the Republic of Letters project did much the same by analysing the correspondence of eighteenth century savants, but it is both the scale of the social web and the complexities of the analyses made possible by cheap processing power. This book covers the major social networks such as Twitter, LinkedIn, Facebook, and Google+, with an emphasis on Twitter. The author also discusses mailbox corpus creation and analysis, and the analysis of semantic web data, and also interestingly, GitHub as a social platform. This book is not a book for the dilettante. More than half the text consists of Python code and the reader really needs to work with the code examples to gain full value from the book. The book also provides a rapid introduction to OAuth, and ranges over topics as diverse as simple text analysis, cluster analysis, natural language processing, and the use of applications such as MongoDB. This is however a very good book for anyone seeking to work with the social web and would serve as a very useful primer or as a textbook for a module on data mining. The code examples are clear and nicely structured, making them easy to follow and work with. The real change has been to the hardware used. My trusty old Android tablet is still in use for checking email and reading news websites at breakfast time - as evidenced by some of the gluckier marks on the screen. The newer seven inch device is still in use as a note taker and I see no reason to change for the moment although I do admit being tempted by the new iPad mini - more because of the software base and the availability of decent keyboard solutions than anything else. Textedit - the android text editor is now unsupported and while I’m continuing to use it successfully I fear that one day there will be an api change on google drive or evernote that will break things. The real change has been the Chromebook. It allows me to check my email. create quick and dirty drafs using either Google Docs and StackEdit, as well as surf the web and research things. If anything has ever demonstrated how much of my day to day reading and specification checking has moved to the web the Chromebook certainly has. It’s also fast, well fast enough, boots quickly and shuts down quickly. It’s not a full featured computer but it most definitely provided on the go functionality. In fact it shows why my original Asus netwbook was such an effective tool and the windows netbook a bit of a clunker - basically load time. The platform is irrelevant, it’s access to a browser that counts. However I still use my windows netbook - the Chromebook’s dependence on the internet makes it useless for off net travel, and my windows netbook does support my Virgin 3G dongle, though admittedly I seem to have been staying in places with poor Virgin coverage lately. My Kindle has become my recreational reading devoce of choice although my vereable Cool-er has taken on a new life as a means of reading Gutenberg epub texts. The Asus netbook has finally reached the end of it’s useful life but I’m tempted to try Crunchbang Linux on it as a basic writing/note machine, especially as it has a nicer keyboard than my seven inch Android tablet. This talk was held at the National Library of Australia. I went out of curiousity expecting a demo of cool things from the Library of Congress. Well there were certainly some cool things but given my current interest in the quantification of impact I came away with something else - a set of arguments and positions about access and impact and what exactly that means. This post is basically my edited and cleaned up notes - any opinions or asides are my own and this is my interpretation of Ed’s talk. Comments and asides are marked up like this. I’ve recently become interested in the history of the Providence Island Company. In abbreviated terms, in the late sixteenth century and early seventeenth centurey there was a slew of Merchant Venturers companies set up to fund and initiate exploration for new lands. This was in the main a reaction to the Spanish conquest of the Aztec and Inca polities and the resultant flood of wealth. There was a range of companies, including the East India Company, but one of the most interesting was the Providence Island Company. The what ? Well if you know anything of the disputes between the king and parliament, and look at the names of the principal investors in the Providence Island Company, some names leap out at you - John Pym for one, and others less well known such as Gregory Gawsell, who was later the treasurer of the Eastern Association, one of the most effective Parliamentary military organisations in the early stages of the civil war. In short the Providence Island Company provided a legitimate vehicle for men who went on to lead the Parliamentary side in the early stages of what became the first English Civil War. None of this is of course new. Historians have known this for years, just as they know that various country houses, such as Broughton Castle in Oxfordshire, owned by the protagonists are known as the scenes of various conversations and resolutions in the run up to the wars. In short they all knew each other, and many of them were connected to the people who signed Charles the first’s death warrant. So being a geek, I thought it might be fun to try and build a social graph and then feed it through a network analysis tool such as Gephi. There is of course no convenient list of names and relationships, so I started building one using YAML - perhaps not the ideal choice, but it lets me do little index card entries for each person, with information like who participated in which body, and who knows who. Due to it’s flexibility YAML allows me to create a little folksonomy rather than trying to make a formal database while I’m working out what I want to do. At some point I’ll probably need to write a little code to express the YAML content as RDF triples. The great virtue of YAML is that it’s text based, which means that I can use regexes and suchlike to extract information from the file. As a data source I’m using wikipedia and following links to compile my YAML folksonomy. Very geeky, but it keeps me amused. And it’s quite fascinating in a geeky sort of way. For example, Thomas Rainsborough, a Leveller leader (in so far as the Levellers had leaders) was related by marriage to John Winthrop, the Puritan governor of Massachusetts and had also visited the Providence Island colony, even though he had no direct relationship with the directors of the Providence Island Company. Once I’ve got a big enough data set I’ll transform it and feed it into Gephi and see what comes out. However this is not just an exercise in geekery, it does have a degree of more general applicability. Universities are very interested these days in the impact that their researchers have. Using similar social network analyses it ought to be possible to show who has collaborated with who, and who regularly they have collaborated with people. As as result of our Metadata stores project we actually have a lot of this data, and will shortly have it in an RDF expression. Potentially by analysing information such as the email addresses used in subsequent papers it might be possible to show where secondary authors (typically graduate students and postdocs) have moved to. Coupled with some bibliometric data this might just give us a measure of the impact graduate students and postdocs within five years say of their moving elsewhere. I’ve been watching the eresearch services thread from the eresearch 2013 conference. I’m beginning to regret not having gone - it looks to have been more interesting than I expected, but that’s life. A lot of people seem to be getting interested in eresearch services. I’ve already expressed my opinions about such things, but generally a heightened level of interest is probably a good thing. In short, you can do perfectly good eresearch with an old laptop and an internet connection, you don’t need all the gee-whizzy stuff, all you need is a problem, the desire to solve it, and a little bit of programming knowledge. exactly what data science is and what the skills required are. weather on supermarket stock levels. techniques such as cluster analysis or topic modelling. not expected to get your hands dirty. anything else, rather than as a backgrounder on data science. What does an eresearch service look like ? There has been a lot of discussion about eresearch and eresearch services. However when you try and pin down what constitutes an eresearch service it seems to be all things to all people. In an effort to try and find some consensu I did a very simple survey. I typed 'eresearch services' into Google and chose pages from Australian universities. I've tabulated the results of this fairly unscientific survey in a google spreadsheet. Each institution of course described the service on offer differently, so the spreadsheet is purely my interpretation of the information available on the web. Other services tend to be more idiosyncratic, perhaps reflecting the strengths of individual institutions. However it's clear that a lot of the effort revolves around facilitation. My personal view is that we do not try to second guess researchers. Instead of prescribing we facilitate by helping researchers get on with the business of research. which suggests what researchers want is advice and someone to help them do what they want to do - a single point of contact. Provision of a single point of contact hides any internal organisational complexity from the researcher, it becomes the contact’s problem to manage access to services and not the researcher’s. we've an old XYZ machine without a network connection, can anyone help with recovering data from it? Not having an ethernet connection is a problem, but assuming that the machine still powers ups and the disk spins, it might not be so much of a problem. The key is to go looking to see if it has terminal application. This isn't as odd a question as a lot of computers were used to access timesharing systems back then in these pre web days, and a terminal application was fairly standard. The good thing about terminal applications back then is that they usually incorporated a serial file transfer protocol such as xmodem, ymodem, zmodem or kermit. Of these kermit is perhaps the best, not the least because it can be put into server mode and you can push files from your host in batches. The good news is that both lrzsz, the ?modem client for linux and ckermit are available for install on ubuntu from the repositories via apt-get. Then all you need is a usb to 9 pin serial adapter cable and a serial nine pin null modem cable - both avaiable from ebay for a few dollars and then you should be ble to transfer data from your old machine to the new. Yo will of course need to set up things like parity and baudrate, and it might be an idea to practice transfering data first by setting up a second linux machine and transferring data between the two - see [http://www.stlinux.com/install/getting-started/serial](http://www.stlinux.com/install/getting-started/serial for an exaple. Despite this sounding a bit of black art, it's actually quite easy. The other good thing is that a number of embedded communications devices are still configured over a serial port, so most network technicians still know something about debugging serial connections. Once you have a managed to establish a working connection you should then be able to get the serial communications software on your problematical machine to talk to your newly enabled serial host. Web archiving is a hazardous business. Content gets created, content gets deleted, content gets changed every minute of every day. There's basically so much content you can't hope to archive it all. Also a lot of web archiving assume that the pages are static, even if they've been generated from a script - pure on the fly pages have no chance of being archived. However you can usually make an assumption that if something was a static web page and there long enough, that it will be on the wayback machine in some form. Not necessarily it turns out. I recently wanted to look at some content I'd written years ago. I didn't have the original source, but I did have the url and I did remember searching successfully for the same content on the wayback machine some years ago. (I even had a screenshot as proof that my memory wasn't playing tricks). So, you would think it would be easy. Nope. Access is denied because the wayback machine honours the sites current robots.txt file, not the one current at the time of the snapshot, meaning that if your favouriet site changes its robots.txt between then and now to deny access you are locked out. If you're someone who follows my twitter stream you may have noticed that I seem to post bursts of tweets around the same time every day. This because I've taken to using Bufferapp to stage some of my tweets. Basically bufferapp is a little application that integrates nicely with Chrome and AddThis which allows you to put tweets into a buffer to be reposted later in the day. I only use the free version, which means that my buffer is only 10 deep, but that seems to cover most of the tweets I'm likely to make in a day. I'm not obsessive compulsive about twitter, no matter what it seems like. When I look at my twitter followers I can say very roughly that the computing and data people are in the same or adjacent timezones to me, but the people interested in the geeky history stuff are clustered in North America and Western Europe - of course that's not quite true, I have followers in South Africa and Chile to name but two, but it's a good enough approximation. In other words the history followers tend to be between eight and eighteen time zones away from me on the east coast of Australia, and hence unlikely to be awake when I'm tweeting (well except for Chile and the west coast of America where there's a few hours of overlap). So I've taken to using bufferapp to delay the tweets for that audience, which has the effect of de cluttering the feed for the computing and data people. Like most people who were in at the beginnings of the internet as something widespread (I'll say sometime around 1991 when JANET connected to the Internet and abandoned Coloured Books for TCP/IP for me) Usenet News filled the niche taken nowadays by twitter and blog feeds. Usenet news fell apart and lost popularity in the main due to it being hijacked by trolls and other malefactors with the result that people walked away from it when the signal to noise ratio got too high. In fact I closed down work's usenet news server a few years ago. It was quite an interesting experience as we had a couple of downstream servers elsewhere that we provided a feed to under an SLA. Finding someone at the downstream sites who could remember what a usenet news server was and why we should agree to terminate the SLA (and the feed) was a task in itself. People really don't use it anymore. However, despite that there's still a couple of technical newsgroups I still find useful, especially now the trolls have abandoned it for twitter and facebook, making the experience kind of like the old days. To access them I use pan running on a minimal crunchbang linux vm. This of course has the problem of getting the information out of pan and into somewhere useful - having that useful post sitting on a vm you run up once a week isn't really that useful. There's lots of ways of solving that problem, but I didn't want to spend a lot of time installing extra software such as dropbox on the vm. My answer is incredibly simple and incredibly old school - install alpine on the vm, set up a dummy account on outlook.com, manually attach the usenet posts as text file and email them to my evernote account, my work account, or where ever suits. The real change has been to the hardware used. My trusty old Android tablet is still in use for checking email and reading news websites at breakfast time - as evidenced by some of the gluckier marks on the screen. The newer seven inch device is still in use as a note taker and I see no reason to change for the moment. The real change has been the Chromebook. It allows me to check my email. create quick and dirty drafs using either Google Docs and StackEdit, as well as surf the web and research things. If anything has ever demonstrated how much of my day to day reading and specification checking has moved to the web the Chromebook certainly has. It's also fast, well fast enough, boots quickly and shuts down quickly. It's not a full featured computer but it most definitely provided on the go functionality. In fact it shows why my original Asus netwbook was such an effective tool and the windows netbook a bit of a clunker - basically load time. The platform is irrelevant, it's access to a browser that counts. On Friday I wrote that you could now use imap with Microsoft's Outlook.com mail service. I also wrote that I'd had problems getting it to work with evolution on a virtual box vm running crunchbang. I still don't know why it didn't work but I'm happy to report that Alpine - the newer updated replacement for Pine - works just fine on the same vm. Pine is a mail program with a heritage going back to the early nineties and was one of the first mailers to use imap. it all worked. Obviously you replace myusername with your account name. Being old school I edited the .pinerc file directly with nano rather than using the Alpine configuration menu. You could of course use gedit, vi, or any other text editor. Microsoft have recently announced that their Outlook.com email service now supports IMAP. So I thought I'd try it with that well known linux gui email client, evolution. I've previously got evolution to work with office 365 so I thought it would be straight forward - change the name of the servers and set the client to be imap and it should work (and royally confused me to boot). It does - or more accurately it does with evolution on ubuntu with a standalone, real machine it works fine. Installing it on a crunchbang linux virtual machine it doesn't for reasons I havn't got to the bottom of. However setting it up is quite simple - basically if you give a Microsoft mail service style address evolution will try and set you up for pop. In the building in which I work we have a raft of public access computers for students. In the old days - like last year - students would come up to them, log in, do work, such as writing papers or running some specialist software, log off, and go away. Recently I've noticed an increasingly common trend whereby they put their laptop on the desk, work on their laptop, and at the same time use the public access computer to access some specialist resource. It's not a rational behaviour but I've seen it often enough to reckon that it's a thing now. It looks like either students have not worked out about sharing content from their university filestore (it's a webdav mount), or we've failed in the communication business by either not telling them this, or not making it easy for them to push data back and forth. Well, having made a stopwords file the thing to do is test it. I chose to use the text of Barbour's Brus, as the Oxford Text archive copy was fairly clean of inline markup, clean enough to fix by hand rather than modifying my original text cleaning code. a little more tweaking might be required, but it has promise as a technique. This statistical generation of stopword lists could also be applied to analyses of bodies of scientific literature by generating discipline specific extra stopword files so one could filter out the common noise words to get a better impression of a research group's strengths and focus from their published papers - something that is increasingly important as at least one study of search practices among researchers suggests a dependence on Google and by implication it's search algorithms. 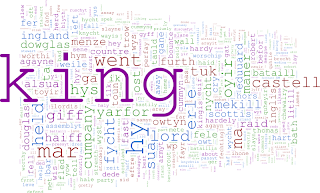 Over a year ago I played with topic modelling and wordclouds. 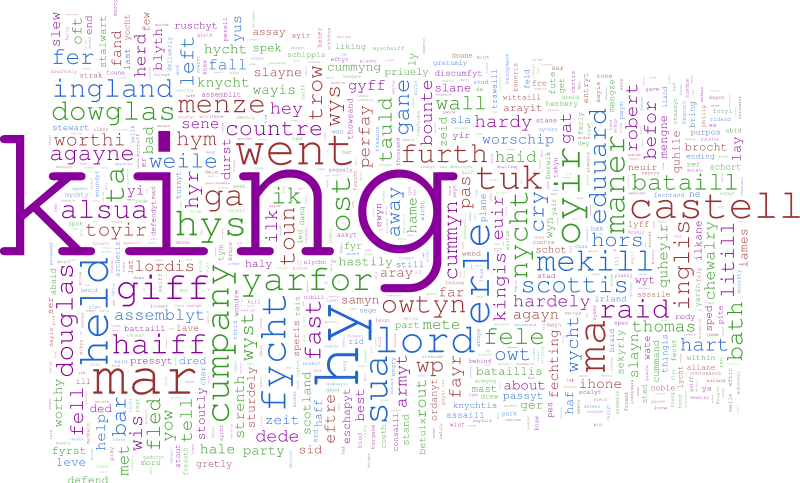 As always the reason has not quite gone away, and a year on, I thought I'd better teach myself how to do it properly using R.
Now one of the things I found when I played about with wordclouds is that if you feed middle english text into a wordcloud it does help to have a middle english stopword file. 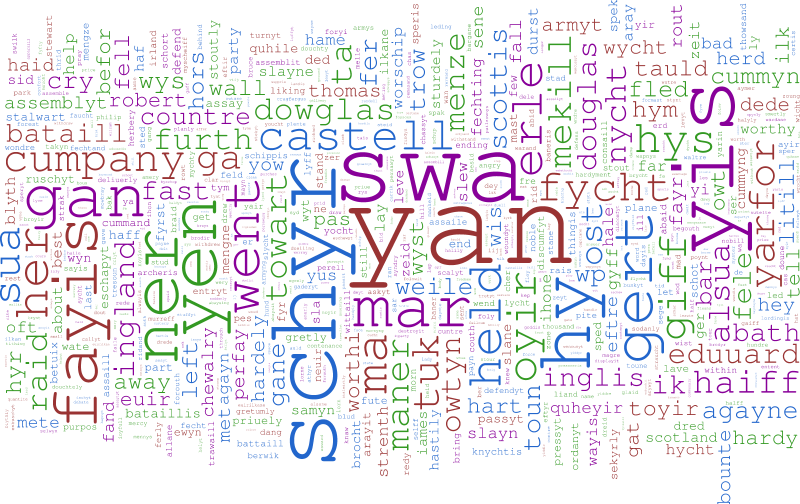 Playing with the Gutenberg version of Troilus and Cressida I found it was quite easy using R to come up with a stopwords file based on the 100 most common words in the file excluding the names of the protagonists. Now, a stopword list based on a single poem might be interesting, but it's not very useful. You need a number of poems to come up with a stopwords file that's valid for a particular author. Then you can do such tricks as comparing the frequency of words (minus the stopwords) between poems. If one has a very different distribution of words it might be by a different author. 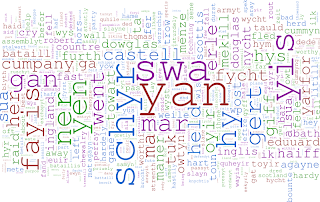 So having discovered how to make a stopwords file I though I'd make a stopwords file for middle scots and then see if I can find frequency differences between various poems by various authors as well as using it to generate wordclouds. For the corpus I chose the works in the Oxford Text Archive Early Scottish Texts archive. I chose middle Scots quite deliberately, as it was (a) different enough from contemporary English in its spelling to treat as if it was a different language, (b) there was a decent body of online text available and (c) it didn't do anything complicated with word endings other than using is for a plural rather than s.
As such it meant that I could use standard off the shelf programs written for contemporary English, but simulate using it it on a different language with all the default assumptions turned off rather than relying on someone else's choice of stopwords. The files came with some angle bracket delimited non-standard markup which was probably intended to be read by some other program. I wrote a simple perl script to remove this markup, remove irrelevant bracketed inline text such as ( ITM ), and a few other stray characters, and while I was at it converted the files to lower case for future processing. I didn't try to fix any orthographic quirks - I made the assumption that all the likely stopwords would be words in common use with an agreed spelling. Given that I'd ended up with a sample of around 860,000 words I was running on the basis that any really common variant would probably turn up in the stopwords file. After some final porcessing with R the source text contained just under 50,000 unique items, which is probably a rich enough corpus, although this may be masking orthographic quirks. The resulting stopword list consists of the first 200 words in the frequency list. A year ago I blogged that skydrive had killed the student filestore. At the time I argued that as students increasingly had multiple computing devices they would tend to self-outsource and store their work on solutions such as google drive, skydrive and dropbox. And a year on, I see no reason to think otherwise. Students do seem to be using such solutions to store their work. They probably start at high school or college, and carry the habit on to university. For the rest of this post I'll talk about skydrive, but it's really shorthand for all the options out there. The one thing that skydrive doesn't do is provide network shares. You cannot use it interactively with an application as if it was a bit of mounted filestore. As always, not quite true, there are solutions like Gladinet that let you do this, which is useful for things like background automated backup, but really doesn't give you a truly interactive service like a sher, purely because it's just too slow. So that got me thinking again about filestores and why we have them. In part it's tradition, just like providing an interactive time sharing unix box. We've done it so we keep on doing it, ignoring the fact that the box never has two or three sessions live on it at any one time. We started providing filestore on a large scale to students twenty or more years ago when computers started becoming really common in education. In the main we did it because we couldn't provide a computer for everyone , and so went for the public toilet model of computer provision - lots of more or less similar computers with more or less similar software. Didn't matter which one you used, it was all the same. Students of course needed somewhere to store heir work between sessions, and making them use floppy disks or other local removable storage was impractable for a whole range of reasons, so we took to providing filestore. In the meantime, computers have become cheap enough so that anyone who can afford course fees can afford a computer, and one that contains more storage than anyone is likely to use over their course. The result is that students have self outsourced for all the routing tasks like essay writing and project reports. In fact the only reason for providing filestore is to allow access to specialist software, whether we deliver this via some sort of VDI solution or via the classic public toilet model - in short they need enough storage for coursework that requires the use of specialist facilities and a means of getting data off it. They have more storage available through services like skydrive than we are likely to provide. A few days ago I trawled some UK university websites (I chose the UK because it is start of the academic year there and thus what it says about provision is current). Most sites seem to offer between 1 and 2GB storage - quite a lot offer only 1GB - significantly less than Skydrive's default of 7GB and Amazon's 5GB, but they all offer ways of easily moving data to and from the filestore, ie there is a tacit admission that they are no longer the primary storage provider. As long as students need access to specialist facilities they will still need filestore as a place to write out their work and to store work in progress between lab sessions. This storage requirement is fairly modest as students have ready access to other storage and consequently we should actively expect them to wish to upload and download data. The storge requirement then ceases to be onerous, a few terabytes at most, and one that can be easily be met by the provision of off the shelf NAS technology. Implicit in this is moving responsibility for looking after their work to students, rather than looking after it for them, meaning that we no longer put substantial resources into mirroring or backing up the student filestore as we treat it purely as work in progress filestore. Given that students have already self outsourced this is not as big a change as it might be, but it is a move that should not happen by default. ... you don't care about the operating system on the device in front of you. The old arguments about how software base is what sold machines and put windows in such a dominant position no longer apply. If(and it is still a big if) everything you use is abstracted to the cloud you really don't care. It's spring here in Canberra, with the days in the low to mid twenties, even if the nights are still chilly. On campus this means that the students finally emerge from their winter burrows and start sitting out during the day, even though they are still doing work. Well, these days students seem to have got over the textbook and notepad thing and use their laptops out of doors. Given we've wifi just about everywhere this means they can sit outside and work providing it's not too far from a building. So in the spirit of my informal surveys of how people read books on the the bus here's my totally unscientific survey. There is no dominant recognisable preferred Windows based computer brand. Given that students carry them around all day I can see why ultrabook style computers are popular. I was surprised at the lack of tablets + keyboards give their better battery life and their potential as note takers.